A signed gate across the road prevents access to Upper Davis Creek Falls, USGS Purcell Mtn (1994 nl) and Davis Valley Falls (u), USGS Purcell Mtn (1994 nl), plus No Trespassing signs now prevent entry to Davis Creek Falls, USGS Purcell Mtn (1994 ns). 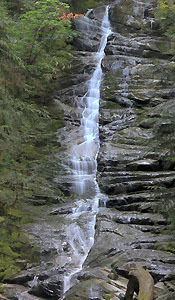 The main descent of Jennings Falls, USGS Packwood (1994 ns) is not readily accessible despite being next to Road #21 along Jennings Creek within Cowlitz Valley Ranger District, Gifford Pinchot National Forest. Kan Falls (u), USGS Purcell Mtn (1994 nl) cannot be seen from the highway. Access is unlikely to any of the following cataracts: Jordan Basin Falls (u), USGS Packwood Lake (1989 nl), Middle Fork Lake Falls (u), USGS Packwood Lake (1989 nl), Upper Middle Fork Falls (u), USGS Packwood Lake (1989 nl), Clear Fork Falls (u), USGS Old Snowy Mtn (1988 nl), and Upper Clear Fork Falls (u), USGS Old Snowy Mtn (1988 nl).